Description: At dawn, October 19, 1864, the Confederate Army of the Valley under Lt. Gen.
Jubal A. Early surprised the Federal army at Cedar Creek and routed the VIII and XIX Army Corps. 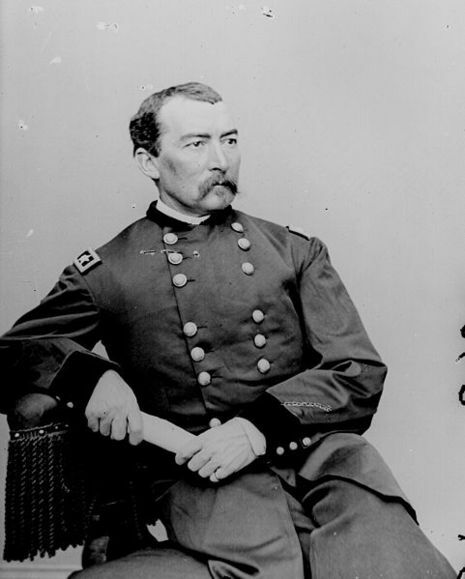 Commander Maj. Gen. Philip Sheridan arrived from Winchester to rally his troops, and, in the afternoon, launched a crushing counterattack, which recovered the battlefield. 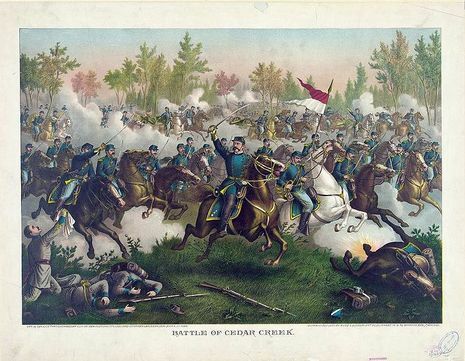 Sheridan’s victory at Cedar Creek broke the back of the Confederate army in the Shenandoah Valley. Lincoln rode the momentum of Sheridan’s victories in the Valley and Sherman’s successes in Georgia to re-election. Early had withdrawn "up the Valley" (southwest into the higher elevations of the Shenandoah Valley) under pressure from Sheridan and his Army of the Shenandoah. Sheridan's army was engaged in destroying the economic base of the Valley, meant to deprive Gen. Robert E. Lee's army of the supplies they required. They were encamped at Cedar Creek, in parts of Frederick, Shenandoah, and Warren Counties of Virginia. 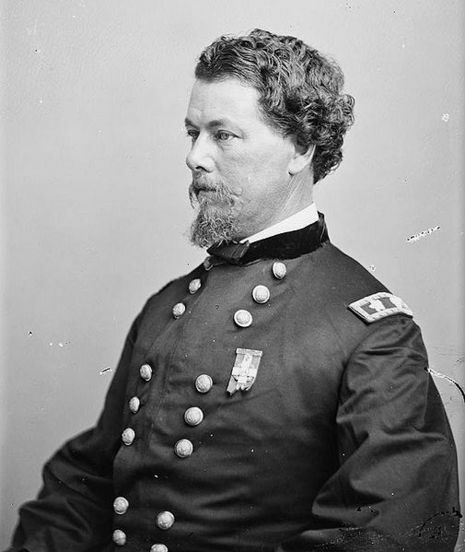 Sheridan ordered the VI Corps, under Horatio G. Wright, to return to the Petersburg siege lines, assuming that Early had no aggressive moves left to him after more than a month of battling. However, after a reconnaissance in force by Early turned into a division-sized skirmish between the armies, Sheridan recalled Wright. 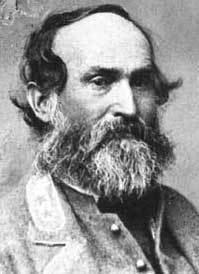 He sent two divisions of cavalry off to raid the Virginia Central Railroad, but Early planted rumors that Lt. Gen. James Longstreet's corps might join him from Petersburg, and Sheridan brought all of his forces back to the camps along Cedar Creek. The pugnacious Early had some aggression left in him and he had Lee's exhortations to take action guiding him. (In a letter of October 12, 1864, Lee told Early, "You had better move against him and endeavor to crush him. ... I do not think Sheridan's infantry or cavalry numerically as large as you suppose.") Early examined the Union position behind Cedar Creek and found an opening. 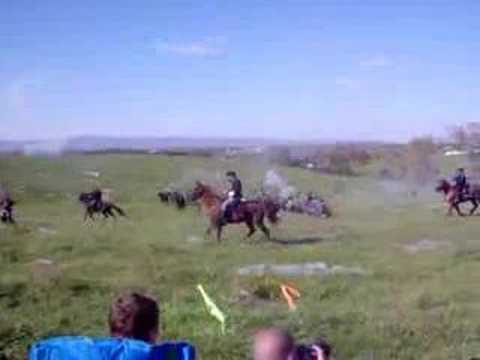 Expecting an attack across the open valley floor to the west, the Union left relied on natural obstacles for cover. Early planned to get his men across the creek and attack the Union left, rolling up the line and defeating each part in detail. His choice was either to attack or retire to replenish his dwindling supplies. Early chose boldness and planned an assault on superior forces, using surprise to his advantage. Early deployed his men in three columns in an audacious night march, lighted only by the moon. Maj. Gen. John B. Gordon's division started at 8:00 p.m. and followed a "pig's path" along the base of Massanutten Mountain and across the river. Just before sunrise, operating under a cover of dense fog, Gordon struck. The surprise was complete, and the first Union corps (Maj. Gen. George Crook's VIII) fought momentarily, then broke. 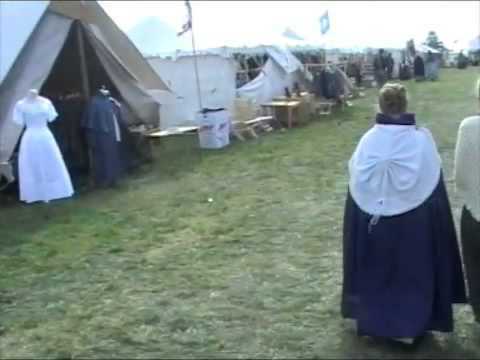 Hundreds of prisoners were taken, many of them still in their bedclothes. During this attack Union Col. Joseph Thoburn was killed and Union Col. J. Howard Kitching was mortally wounded. The XIX Corps under Maj. Gen. William Emory was next to be hit, by Gordon and the division of Maj. Gen. Joseph B. Kershaw, who joined the attack from the west, and Emory's soldiers broke, too. The Confederate assault moved so swiftly that they had little time to prepare. Retreating soldiers from Emory's corps caused confusion and damaged the morale of the defenders. And since their hasty battle line faced south rather than west, Confederate guns across the creek were able to shell the open Union flank. Wright's VI Corps, last in the line, fought a strong defensive battle, withdrawing slowly under heavy pressure. He attempted to advance his lines southward to meet Early's initial assault, but the attack moved too quickly for him to get them moving. Early did not keep up his pressure, however, so pleased was he with his victory, including the capture of over a thousand prisoners and eighteen guns. He mistakenly assumed that Wright would retreat from the battlefield. He told Gordon, "This is glory enough for one day." The Union troops had withdrawn past Middletown. His failure to pursue them is considered his fatal mistake in the battle and caused lasting enmity between him and Gordon. Sheridan was away at Winchester, Virginia, at the time the battle started. Hearing the distant sounds of artillery, he rode aggressively to his command. 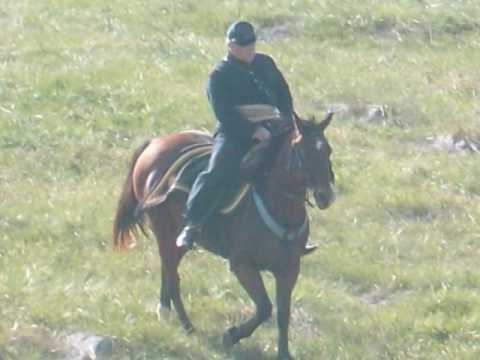 (A famous poem, Sheridan's Ride, was written by Thomas Buchanan Read to commemorate this event.) 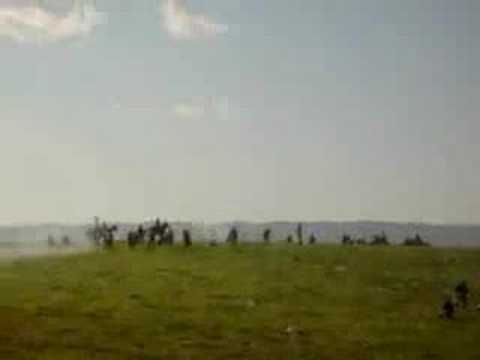 He reached the battlefield about 10:30 a.m. and began to rally his men. Fortunately for Sheridan, Early's men were too occupied to take notice; they were hungry and exhausted and fell out of their ranks to pillage the Union camps. At 3:00 p.m. Early resumed his offensive with a minor attack that might have succeeded in the morning, but was easily repulsed. 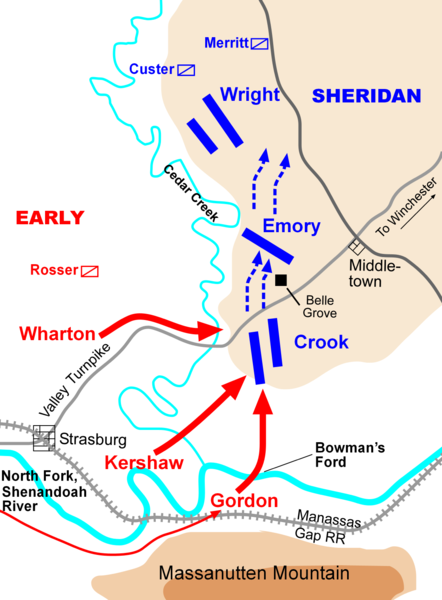 At 4:00 p.m., Emory's corps counterattacked. Early's three divisions were stretched out on a line about three miles (5 km) long, with the flanks unprotected. 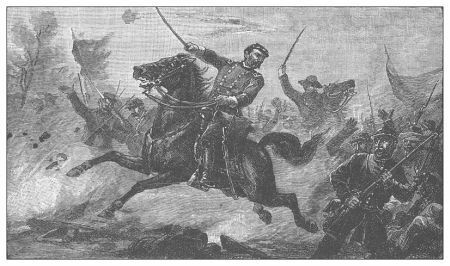 Emory was reinforced by George A. Custer's cavalry division, which exploited the open left flank and broke the Confederate line. Other cavalry units destroyed a bridge in the Confederate rear, cutting off their escape route. Many of the veteran Southern troops surrendered, certain they could not fight their way out of the debacle. The Union took hundreds of prisoners, 43 guns (18 of which were their own guns from the morning), and supplies that the Confederacy could not replace. The battle resulted in a crushing defeat for the Confederacy. They were never again able to threaten Washington, D.C., through the Shenandoah Valley, nor protect the economic base in the Valley. The reelection of Abraham Lincoln was materially aided by this victory and Phil Sheridan received lasting fame. Jubal Early's command was effectively ended and his surviving units returned to assist Robert E. Lee in Petersburg that December. Future U.S. Senator Henry A. du Pont was awarded the Medal of Honor for his handling of an early retreat at Cedar Creek, contributing to Sheridan's ultimate victory. The participation of the Vermont Brigade in the battle (more Vermonters took part in this battle than any other in the war) is commemorated by a large wall-sized painting in the Cedar Creek Room on the second floor of the Vermont State House in Montpelier. 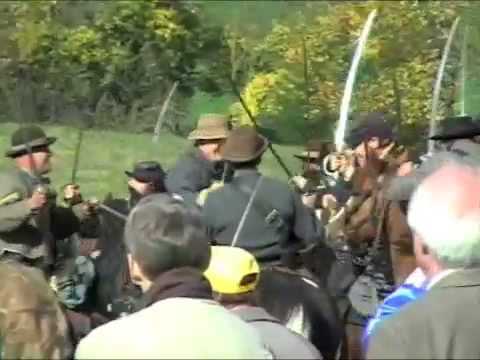 In 1997, proposed highway construction threatened a ridge where the 8th Vermont Regiment, commanded by Stephen Thomas, lost nearly two-thirds of its men in a heroic early morning stand. The proposal prompted the Vermont State Legislature to adopt a resolution asking Virginia to prevent building on the ridge. More than 1,450 acres (5.9 km2) of the Cedar Creek Battlefield are preserved as part of the Cedar Creek and Belle Grove National Historical Park. Cedar Creek and Belle Grove National Historical Park is a partnership park, with much of the land owned by nonprofit preservation groups, including the National Trust for Historic Preservation, the Shenandoah Valley Battlefields Foundation, Belle Grove Plantation, the Potomac Conservancy and the Cedar Creek Battlefield Foundation. In addition, nonprofit groups such as the Civil War Preservation Trust have contributed substantial funding toward protection of these lands. In May 2008, the Frederick County Board of Supervisors voted to allow Carmeuse Lime and Stone to expand its existing operation on the Cedar Creek Battlefield. The vote permits Carmeuse to mine 394 acres (1.59 km2) of core battlefield land at Cedar Creek. In response to this decision, an alliance of national and local preservation groups formed the Cedar Creek and Belle Grove Coalition to increase public awareness about the impact of the new mining on the battlefield, as well as to promote future preservation efforts at Cedar Creek. 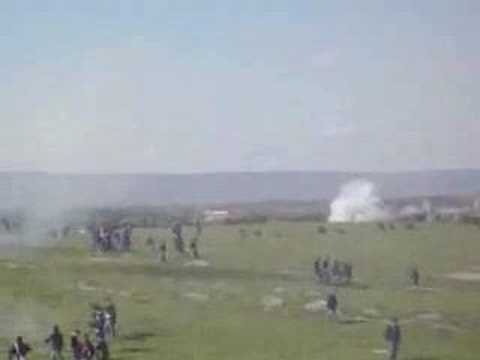 In October 2008, in conjunction with the 144th anniversary of the battle, the Coalition released a website and animated map to help better explain the impact the mining will have on the battlefield.